Rajasthani miniatures evolved in Marwar-Mewar region as textual illustrations to the Jain text Kalpa-Sutras around the early 15th century. There reflects in these paintings a continuity of the great traditions of Ajanta murals and Jain art of Gujrat. This initial art style, which manifests in its most evolved form in the Bhagavata paintings rendered at Palam in 1555 and reflects in all subsequent major or minor art styles of Rajasthan, is a blend of indigenous art forms and the elements of the art traditions of Ajanta and Gujarat. The art of miniature painting gained popularity in Bikaner in the 15th century; a phenomenon ascertained by the influence of Jainism that time. The miniature artists, usually of the Usta and Matheran communities, used to paint both specially treated paper and the surfaces of walls. The bulk of miniature paintings that depicts the initial art style of Rajasthan in its most undiluted form, is reported from Mewar. Bold lines, emotionally charged faces, sharp features, robust figures and basic bright colours are its distinctive features. Illustrations to Dhola Maru rendered at Aghatpur, Gita-Gobinda and Rasa Manjari are amongst the earliest known examples of Mewar style. Texts like Rasikapriya, Surasagara, Ramayana, Bihari-Satsai, despite intrusion of Mughal elements, were the dominant themes of Mewar. Painters like Sahibdin and Manohar, using Mughals’ stylistic perfection and the themes of Indian origin, created several timeless masterpieces. In serialising folks like Dhola Maru, Bhakti-ro-patra, Panchakhyano-ro-patra, Bana-bheda-ro-patra, abstractions like Ragamala the Mewar art has the fragrance of its soil. Bikaner style is predominated by Mughal elements. It is partly because most of its master artists, Ali Raza, Ustad Sahibdin, Rukunudin, Nuruddin and Murad, had come from the Mughal world and were adept in the Mughal style. But, despite, in its themes Bikaner always inclined to Hindu myths and legends like Krishna-Lila, Ramayana, Bhagavata, Devi-Mahatmya and Ragamala. Depictions of village life, Baramasa, festivals, processions, hunting and the like also have an indigenous touch. Perfect technical execution, maturity of form, elegance and soft colour effects, the widely known ‘neem-kalam’, is in contrast to Rajasthan’s bright deep tones, characterised Bikaner miniatures. Today the artists still practicing, paint exclusively on paper and are known for their fine brush- strokes and subtle shading. The practice of using natural pigments makes the preparation procedure considerably elaborate and time consuming; while older paintings reveal the use of pure colours, in current practice the colours are usually mixed in order to tone down their brilliance. The colors used by the miniature artists were made from minerals, vegetables, precious stones, indigo, conch shells, pure gold and silver. The prepariing and mixing of colors was an elaborate process and it took weeks, sometimes months, to get the desired results. Very fine, specially created brushes were made for different kinds of paintings. The landscape changed, the colours used were varied, paintings were done on paper and palm leaf to illustrate manuscripts, and on walls of palaces and the inner chambers of forts, Havelis (the painted Havelis of Shekhawati are well-known), and paintings were done on cloth. Subjects of Miniature paintings are krishan lila(sports of Krishna), raga raginis(Musical melodies), nayika Bheda(diff classes of heroines on which Sanskrit and Hindu writers on love, classified women), ritu chitra(seasons), panchatantra. The paintings give an insight into the life of the royals and the common man, the beauty of their womenfolk and the inspirations and devotions of the artists themselves. Music is associated with paintings here The different ragas were considered appropriate to different seasons..The order of seasons are Bhairava, Malava, Sri-Raga, Hindola or vasanta, Dipaka and Megha each of which is wedded to the five Raginis, or nymphs of harmony presenting wonderfully diversed images for the artist’s imagination. 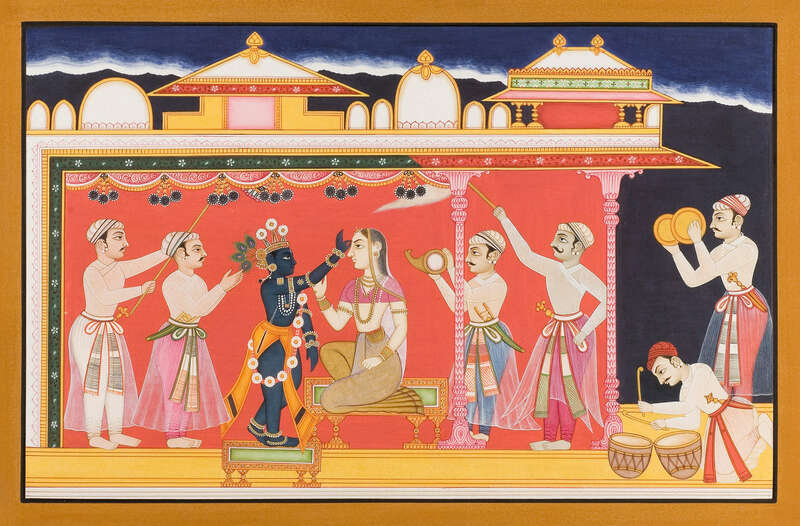 the rajasthani school of miniature painting started in the 16th century. This covers a large area from jaisalmer and Bikaner in the west to Kotah and Bundi in south-east rajasthan and to Datia and Orchha in North Madhya Pradesh. The principal centres of this art were Udiapur, Jaipur, Jodhpur and Bikaner. During the 17th century, art was at its peak in Rajasthan. The major distinction between Mogul art and Rajput period is that the mogul art was centered during the Imperial court and was very standard in its depiction, whereas the Rajput styles differed according to the areas they belonged to. Broadly, we can divide Rajput art with respect to geography- rajput kingdoms in rajasthan, in the Punjab hills and Central India. Top painting pioneers of India every art enthusiast must know about.